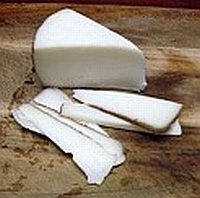 Drunken goat cheese, known as queso de cabra al vino in Spanish, is a semi-firm cheese from the Murcia region of Spain. Before you ever taste it, this cheese's appearance will impress. The rind is a striking purplish red, which creates an impressive contrast to the creamy white interior. The color of the rind comes from its 3-day soaking in Doble Pasta wine — hence the name. A further aging for 75 days after its bath allows the cheese and wine flavors to intermingle, producing an incredible taste combination. The cheese itself is semi-firm, and incredibly rich and smooth, due to its high fat content (those wet-looking spots on the cutting board are from the fat in the cheese). It has a mild taste with just a hint of sharpness, and the edible rind imparts a delicious fruity flavor, making a delightful taste sensation. This cheese is reputed to be difficult to locate; however, I was pleasantly surprised to find a prominent, attractive display at a local grocery called Rouses. If you can't find a local grocer or deli that carries it, there are quite a few options for ordering on the internet. This is really one goat cheese that you don't want to miss. If you're a goat cheese lover, this goat cheese with wine is worth the extra effort it might take to locate. My first experience with it certainly won't be my last!